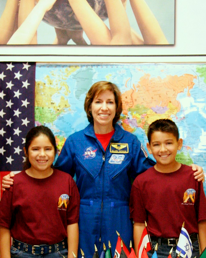 Ellen Ochoa became the first Hispanic woman in the world to go to space when she served on a nine-day mission aboard the shuttle Discovery in 1993. The astronauts were studying the Earth’s ozone layer. In her honor, Pasco School District in Pasco, Washington had named their newest middle school after her. Ochoa was selected by NASA in January 1990 and became an astronaut in July 1991. Her technical assignments in the Astronaut Office includes serving as the crew representative for flight software, computer hardware and robotics, Assistant for Space Station to the Chief of the Astronaut Office, lead spacecraft communicator(CAPCOM) in Mission Control, and as acting as Deputy Chief of the Astronaut Office. A veteran of four Space flights, Ochoa has logged over 978 hours in space. She was a mission specialist on STS-56 (1993), was payload commander on STS-66, and was mission specialist and flight engineer on STS-96and STS-110(2002). She is currently Deputy Director of the Johnson Space Center, helping to manage and direct the Astronaut Office and Aircraft Operations, and is retired from spacecraft operations.